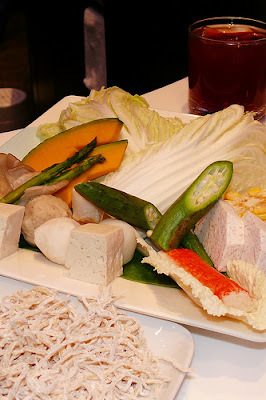 I have come to love eating shabu-shabu and that's good news because it means eating more vegetables and less grease laden food. Another thing I like about shabu-shabu is the fact that I get to cook my own food. Now, this may not appeal to some people who go to restaurants precisely to have other people cook food for them, but me, I actually enjoy it. My mom, who I assumed belongs to the first group, surprisingly liked the shabu-shabu experience when I treated her to one for dinner. Don't knock it 'til you've tried it, eh? 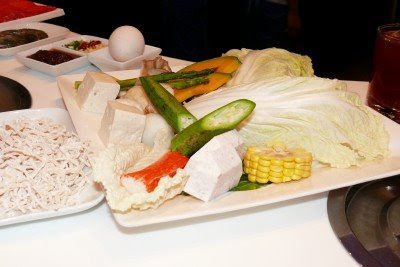 A shabu-shabu meal usually includes pechay, pechay baguio, corn, tofu, taro, squid ball, chicken ball, pork ball, fish cake, crab stick, and noodles. 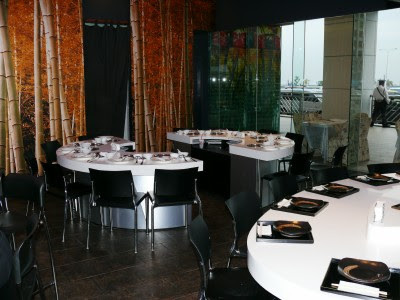 The items included in the set vary depending on the restaurant. Some restaurants offer two modes of cooking your meal-- the hot plate and the hot pot. Others offer just the hot pot where the food is cooked in boiling hot broth. Then you get assorted choices of meats to go with the veggies-- lamb, beef, pork, chicken, sea food, sometimes even Kobe beef. The meat possibilities are limitless. We first ate at Gala Shabu-Shabu and Teppanyaki at the SM Mall of Asia around March of this year, and we've been going back there for our shabu-shabu fix since then. I like their special spicy sauce which they prepare for you at your request. We usually order the beef set which is priced at Php229. The order is already good for two, so it's a very good deal. Their Php40 drink all you can house iced tea is also a fixture in all my meals at Gala which I always get at least four rounds of every single time. Hi, when you say "beef set", what does this include? Is one set enough for two people, or do you have to add additional veggies, etc? Thanks! I'm looking for reasonable shabu-shabu places.